How could living materials be used in a home? Consider the benefits to be gained from a chimney that heals after damage, a roof that breathes to control airflow, surfaces that don’t flake or fade, and a driveway that eats oil to clean up after spills. Existing structural materials used for the construction of buildings, homes, and infrastructures involve high production and transportation costs, are less adaptable to changes in immediate surroundings, and wear out due to age and damage. Living biological materials, such as coral, bark, skin, and bone, have the ability to grow on-demand, repair themselves when damaged, and respond to changes in their environments. These capabilities make them advantageous over the non-living materials used for construction. Significant benefits could be achieved when living materials are included in human-built environments. However, researchers and engineers are not able to easily manipulate the shape and size of living materials that would allow them to be used in construction applications. 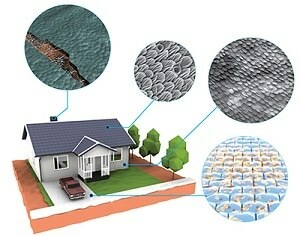 DARPA has announced the launch of the Engineered Living Materials (ELM) program with the objective of developing a new class of materials that exhibit both the structural properties of conventional building materials as well as the unique attributes of biological systems. Living materials provide an opportunity to use engineered biology to address existing problems related to the construction and maintenance of built environments. New capabilities can be created to design smart infrastructure capable of dynamically responding to its surroundings. The vision of the ELM program is to grow materials on demand where they are needed. Imagine that instead of shipping finished materials, we can ship precursors and rapidly grow them on site using local resources. And, since the materials will be alive, they will be able to respond to changes in their environment and heal themselves in response to damage. Gallivan envisions that although grown materials are not a completely new thing, their current manifestations vary considerably from the materials. For example, biologically sourced structural materials are already developed into specified shapes and sizes from low-cost feedstocks. Two modern examples are building blocks created using sand and bacteria and packing materials created from fungal mycelium. Wood is another material that has been employed in construction applications for many years. However, these products are made inert during the production process so that they only show original biological advantages of some of their components. Researchers are making progress with 3D printing of live organs and tissues with the help of scaffolding materials that support the long-term viability of the live cells. These cells are obtained from existing natural tissues but are not engineered to execute artificial functions. Also, existing cell-printing techniques are too expensive to make building materials at required scales. ELM aims to integrate the best features of these current technologies and leveraging them to produce hybrid materials consisting of non-living scaffolds, which provide the structure and support to the long-term viability of engineered living cells. DARPA has plans for the development of scalable and generalizable platform technologies to enable a rapid transition from the laboratory stage to commercial applications. Developing an ability to directly engineer structural properties into the genomes of living systems is the long-term goal of the ELM program, eliminating the need for scaffolds or external development cues for an organism to achieve the required shape and properties. To achieve this objective, scientists need to understand the developmental pathways and their role in the 3D development of multicellular systems. Work on ELM will involve performing fundamental research in controlled laboratory settings. DARPA does not expect environmental discharge during the program.